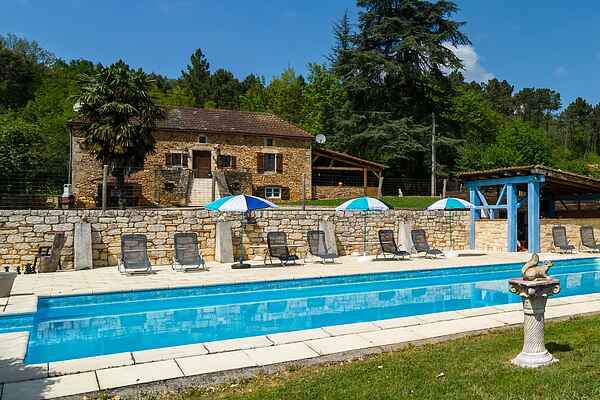 Tread literally in Napoleon's footsteps, in his former country estate in Blanquefort-sur-Briolance (8 km by car; 4 km as the crow flies) The house has a magnificent view out across the forested surrounding hills. Enjoy yourself in the private swimming poll with its sun terrace. Where you will also find a stone BBQ. Inside the house is an open fireplace (with woodpile) and an area with fitness equipment, washing machine and freezer. The area around the holiday home is hilly and forested, making it ideal for lovely walks or bike rides from the house (six bikes available - one child's bike). The region is also well placed for culinary delights. The area is well known for its walnuts, truffles and of course for fois gras. Culture lovers will also be in their element. With the imposing castle at Château de Bonaguil (14 km) and the beautiful bastide town of Monpazier (13 km) Where you will find a lovely arcade square. In Belvès (23 km), below the market hall you will find the underground dungeons that may have served as cave dwellings. Don't miss Monflanquin (33 km). There is a great water park for the kids at Le Bugue (41 km).